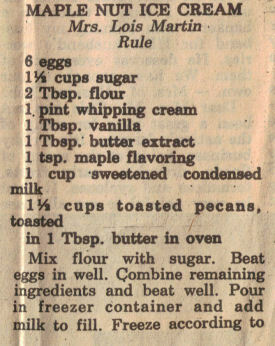 This recipe was clipped from a newspaper, date unknown. There’s a banana nut variation included at the bottom. Recipe is typed below along with a scanned copy (last section of directions is at the top of the next column so it’s not included in the scan). Mix flour with sugar. Beat eggs in well. Combine remaining ingredients and beat well. Pour in freezer container and add milk to fill. Freeze according to manufacturer’s directions. Banana nut ice cream can be made by leaving out the maple flavoring and adding 6 mashed bananas. Put 2 Tbsp. lemon juice on the bananas to keep them from turning dark.